The Scandinavian Weavers Study Group will meet on the following Sundays at 2pm in the fall of 2015 through Spring 2016: October 18 (field trip to the home of Karin Maahs), November 15 (Rya Exploration at 12:30 and Scandinavian Weavers at 2), December 13 (holiday gathering at the home of Karen Weiberg), January 17, February 21, March 20, April 17, May 15. There will be an exhibit of Lila Nelson’s tapestries at the Textile Center, in the Studio Gallery, in November and December of this year. It will be a great kick-off and tie-in to a larger retrospective of Lila’s works at Vesterheim. The Vesterheim exhibit will include more than just tapestry, and will be in the large gallery space near the entrance to the museum. It will be up from December 2, 2015 and probably through November of 2016. Francie Iverson, Claire Selkurt, and I are meeting to choose the tapestries to be displayed, and Laurann will facilitate sending them to the Textile Center. The Scandinavian Weavers next exhibit, featuring our work with RED, will be in the Textile Center Community Gallery, from May 13-June 25, 2016. We will make plans for an opening celebration at our meeting on March 20. We will make postcards, to be distributed by each weaver. 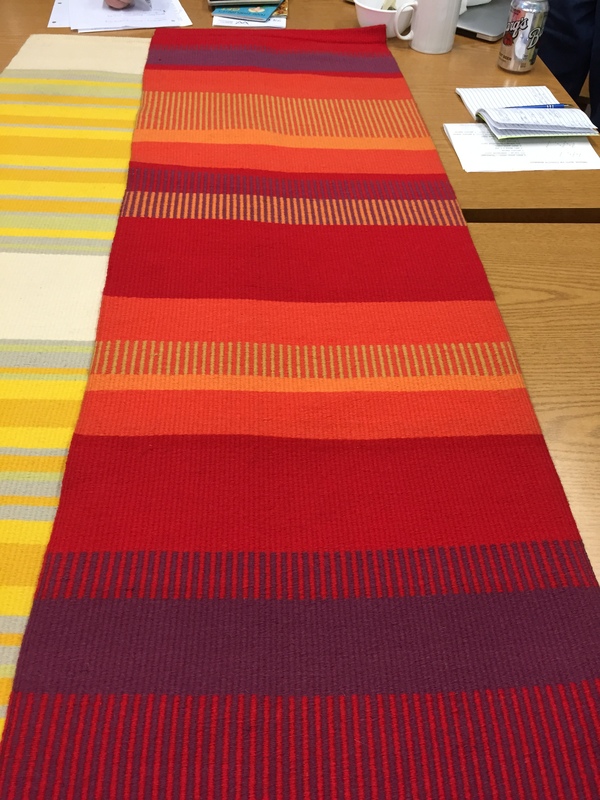 If you would like to have your weaving considered for the postcard image, a high-quality digital image should be submitted by March 20. 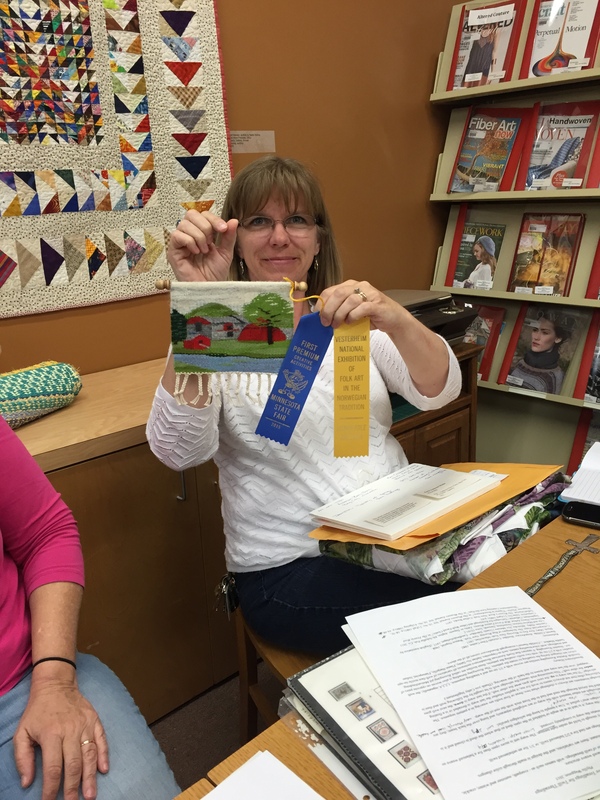 Karin Maah’s tapestry got a State Fair blue ribbon and honorable mention at Vesterheim. She also brought a beautiful quilt top, her first, made with a rainbow of batik squares. Marilyn Moore’s beautiful rag rug with rosepath designs got a red ribbon at Vesterheim, and a white ribbon and “Best First Weaving” at the State Fair. 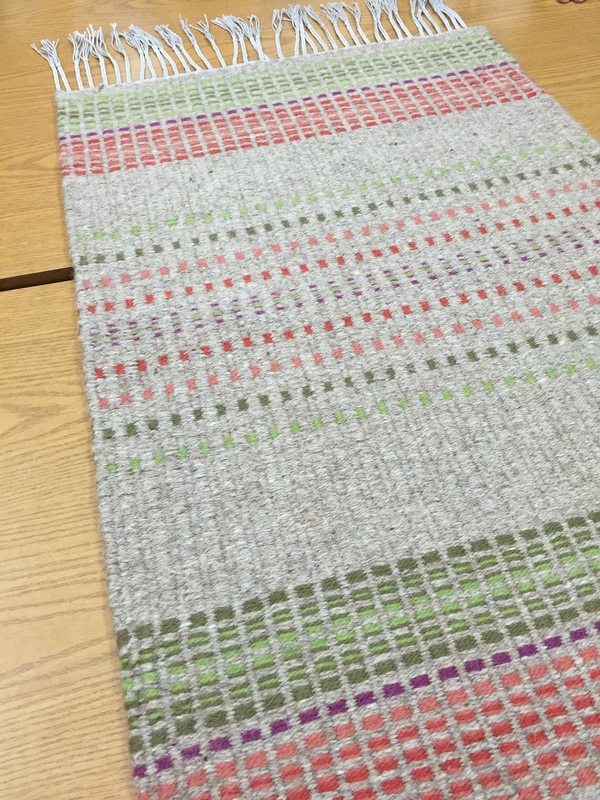 Lisa Bauch learned a Finnish raanu technique in Wynne Mattila’s class, and she made a new piece, based on the colors of early spring leaves.